Hurrah! It's Friday! And in Canada, it's a Friday kicking off a long holiday weekend... and that's not all! For May 15 in North America (see, something for my American friends too!) 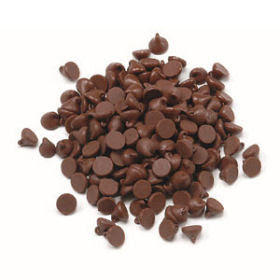 it's National Chocolate Chip Day! Any day that celebrates the joy the chocolate *anything* brings, is good enough for me! Now, before we get too far ahead of ourselves, apparently this Choco Chip Day is also feted by some folk on August 4. TWO special days for the humble chocolate chip - gee, I never knew that this little droplet of cocoa happiness was so powerful. Indulge! Perhaps a Dairy Queen Chocolate Xtreme Blizzard is in order... not sure if there are chocolate chips in there -- do chocolate pieces count? -- but we can pretend *just because*. hope you have a great holiday weekend - God bless the queen!